This post has been sponsored by Danimals, Glad, Hidden Valley Ranch, Horizon Organic, Kleenex, and NABISCO. 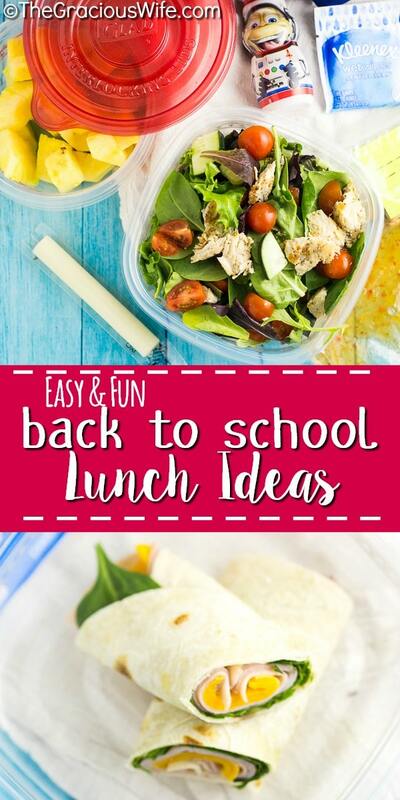 Get ready for the school year with these super fun and easy school lunch ideas for kids that are so fun (AND they can actually help pack for themselves!). 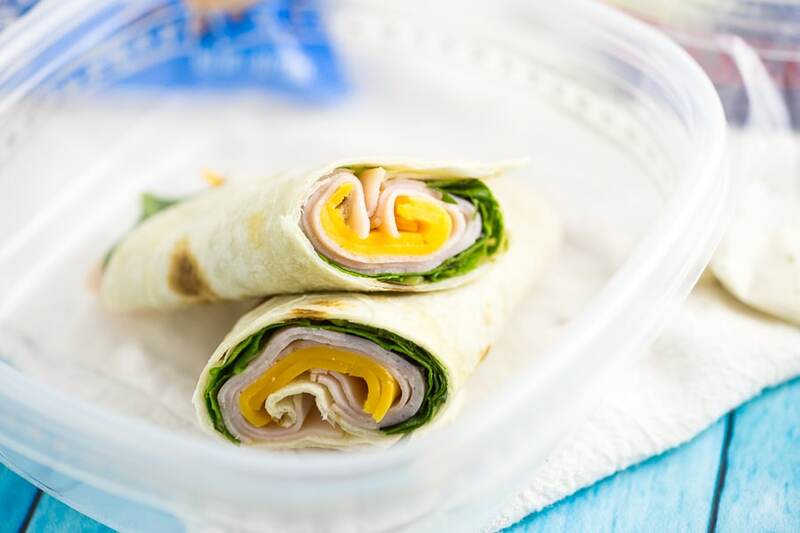 You can even prep and make ahead these kid-friendly lunches! Plus, find three extra ways to add a little fun and a big smile to your child’s school lunchtime! We are about to say goodbye to the sweet lazy summer days, and hello to chaotic mornings and lots of lunch packing once again. 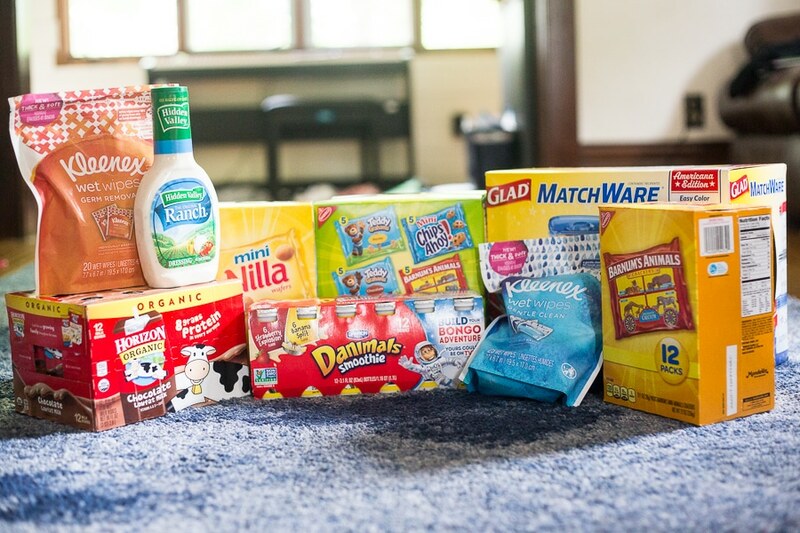 I’m excited to partner with Danimals, Glad, Hidden Valley Ranch, Horizon Organic, Kleenex, and NABISCO to share some fun lunch ideas for your kids this year PLUS how I get my kids to help pack their own lunch (Yes, they really help me with this. Every day!). Before we can even get started packing any lunches, we need to grab the supplies! Usually, we head out to Target after soccer games on Saturday to get everything we need. This way, I don’t have to worry about it on Sunday, and the kids have everything ready to go Sunday night for school the next day. We’ll usually get some fruits and veggies, Hidden Valley Ranch Dressing for dipping, cheese, cheese sticks, lunch meat, drinks like Horizon Organic Single Serve Milk Boxes and Danimals Strawberry Explosion Smoothies, a few fun snacks like NABISCO Cookie Multipacks, BARNUM’S Animal Crackers, and Mini NILLA Wafers, plus Kleenex Wet Wipes. We also like to pack the kids’ lunch in Glad Matchware Food Storage containers, which we definitely need to restock on at the beginning of the year. I just love that I can find everything I need at Target, all in one place. And I have to admit that I also love browsing the entire store while I’m there. It feeds my new-pretty-dishes habit. 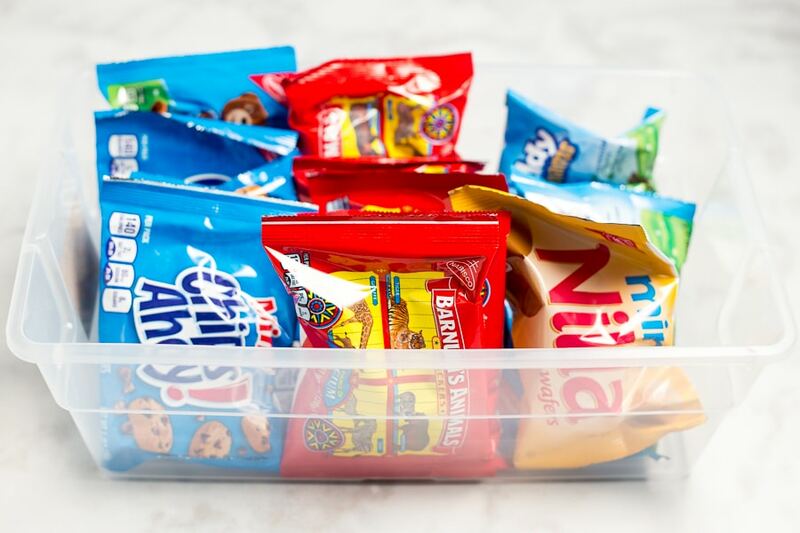 So, first head to Target to pick up all your kids’ favorites and everything you need to pack some fun and easy school lunches. To find a Target near you, head to their store locator here. 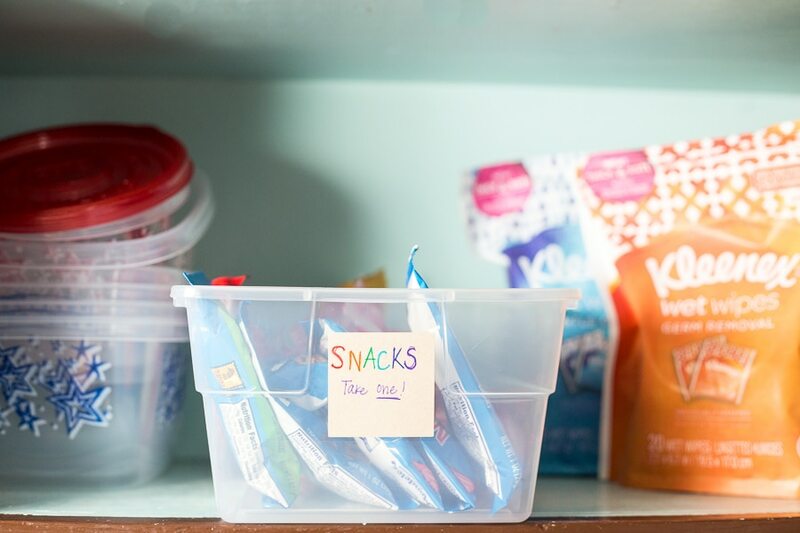 Now that we have everything we need to pack lunches, here’s the tough part: Getting your kids to actually help pack their own lunches. My first and biggest tip is to have the kids help you come up with lunch menus (and I’ll share two of our ideas below!). If they love what they’re eating, they’ll be excited to make it, and they’ll actually eat it. For example, my kids LOVE having Horizon Organic Single Serve Milk Boxes for lunch. I like that they’re shelf stable so they don’t need to be refrigerated all the time. We’ll just keep a few cold at a time to save space in the fridge. 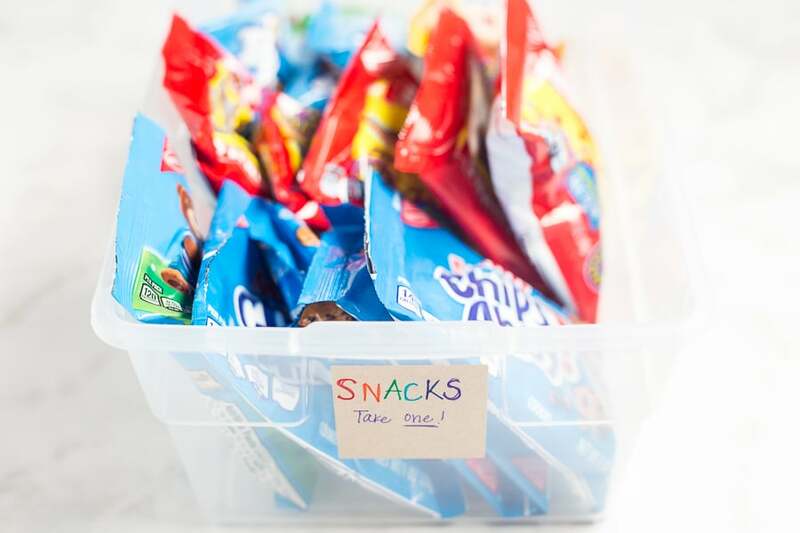 The other thing we do that encourages the kids to help pack their own lunches is to make stations where they can always find all their favorite ingredients. We have a couple different stations for them to grab what they need and go. The bins at each station are labeled, so the kids always remember what to grab and don’t overdo it at one station. This really helps them because it makes packing lunch super quick and easy and less of a big daunting chore. We have a pantry station that includes snack items like NABISCO Cookie Multipacks, BARNUM’S Animal Crackers, and Mini NILLA Wafers. The kids get to choose one of these items for their lunch, and the bin is labeled to remind them. Also in the pantry are extra Glad Matchware, in case they do want to make something, like a sandwich, that I haven’t already prepped and put in the fridge for them, and Kleenex Wet Wipes. My kids and I both love the Kleenex Wet Wipes because it seems like no matter what they eat, they’re always messy and sticky afterward. The wipes are refreshing and gentle and can be used on the hands and face. I even keep some in car. Since they’re individually wrapped, they don’t even dry out on you! Our other main station is the fridge station. This one includes anything that needs to be refrigerated like, pre-prepped fruits and veggies, Hidden Valley Ranch Dressing (because my kids, and okay me too, LOVE eating ranch with our veggies!) 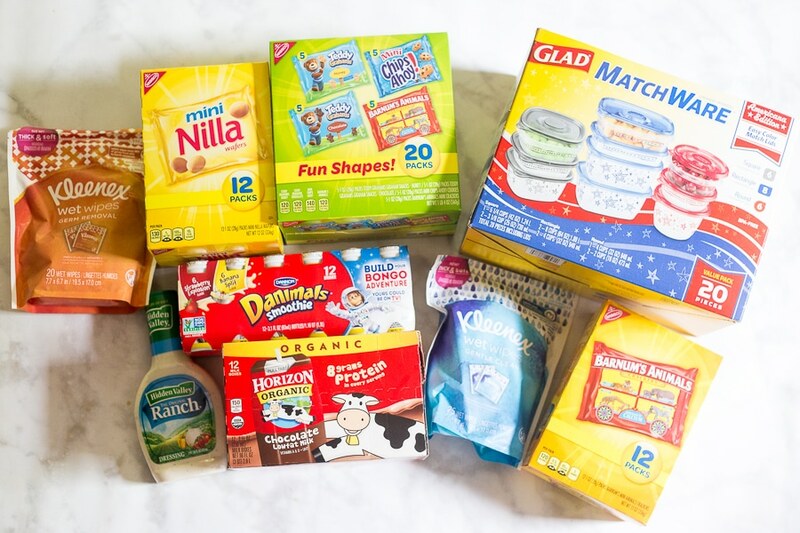 cheese sticks, Danimals Smoothies, and Horizon Organic Single Serve Milk Boxes (these don’t need to be refrigerated, but my kids like them cold, so we keep them in there before packing.). The kids are allowed to grab a cheesestick, fruit, and veggies, help themselves to the ranch if they need it, and choose one drink. We also keep pre-made lunch items like wraps or salads in Glad Matchware containers in the fridge, which they choose one of for the day. 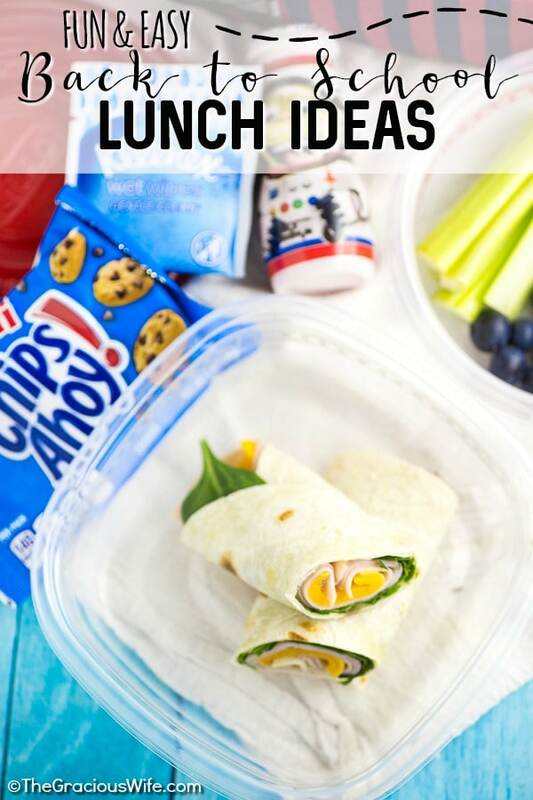 Now that you’re ready to get your kids helping to pack their own lunch, I want to share some lunch menu ideas to get you started, plus 3 ways to add a little fun and a smile to your kiddo’s lunchtime. Directions: Place tortilla flat. Layer with lettuce, turkey, and cheese. Roll up. Cut in half, if desired. Place in 3-1/8 cup Glad container. In a 2-cup Glad container, place 5 celery sticks and 1/2 cup blueberries. Pour 1 tablespoon Hidden Valley Ranch Dressing into a baggy and place in container with celery. 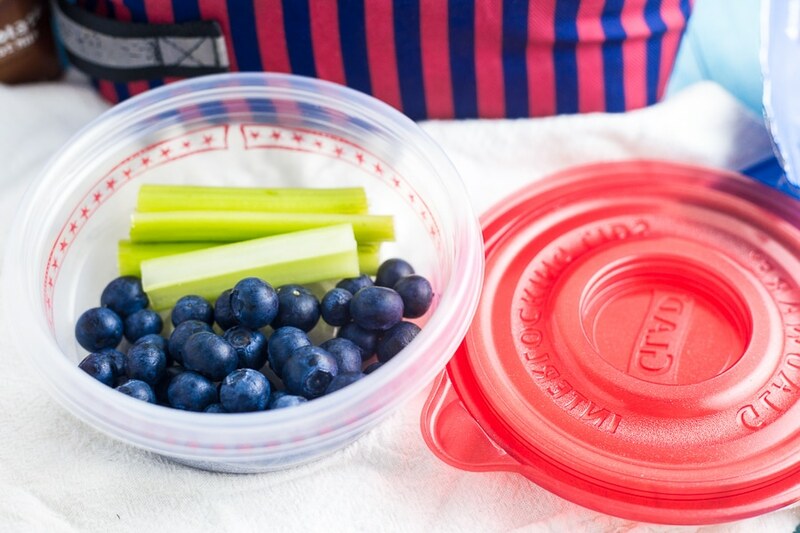 Pack Glad containers with wrap, fruit, and veggies in the lunchbox. Pack remaining items. Keep refrigerated or with an ice pack until it’s time for school! Pro tip: Put the dressing in the baggy. 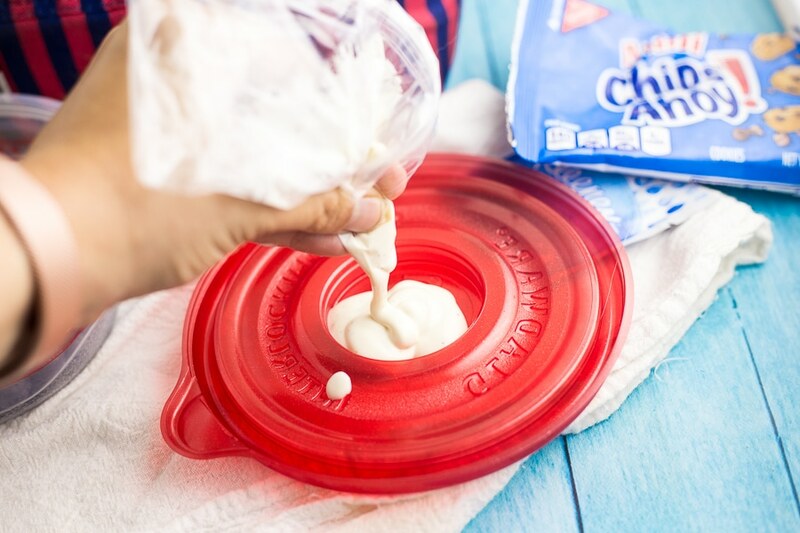 Then when your kid gets to school, they can use the lid from the Glad container as a dip holder and just snip off the corner of the bag to pour it in! Directions: Place chopped lettuce in a 3-1/8 Glad container. Add chopped veggies and chicken on top. Pour 2 tablespoons Italian dressing into a baggy. 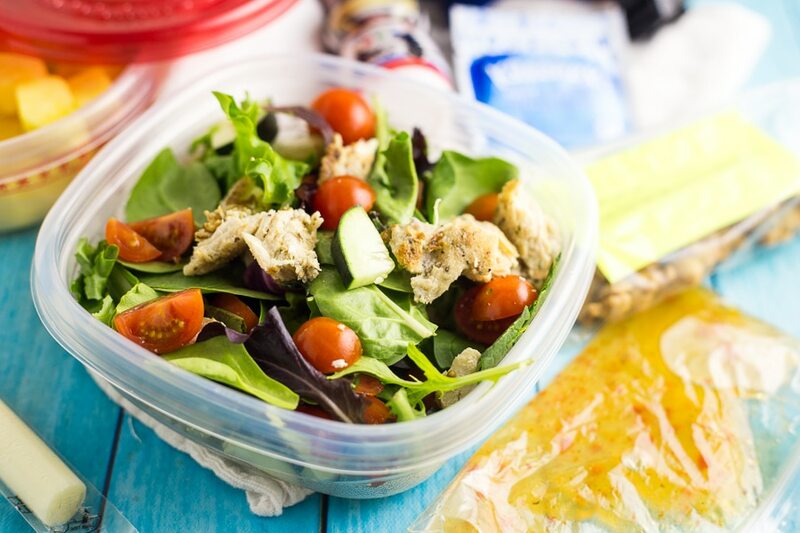 Seal and place the baggy and place inside the Glad container with a fork (Use the same trick above to keep the salad fresh, not soggy. Just snip the corner to eat at lunch time!). Place the lid on the Glad container. Add 1/2 cup pineapple chunks to a 2-cup Glad container, and seal with lid. 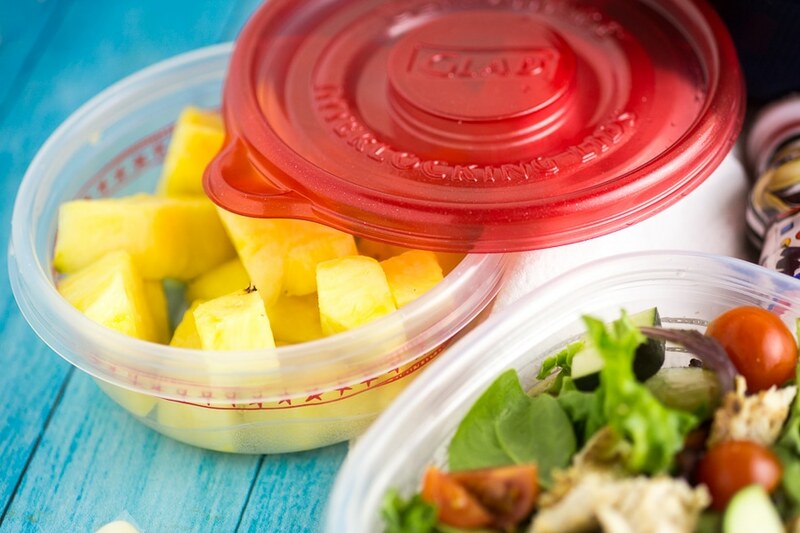 Place Glad containers in the lunchbox. Add string cheese, TEDDY GRAHAMS Snacks, Danimals Strawberry Smoothie, and 1 individually wrapped Kleenex Wet Wipes. Keep refrigerated or with an ice pack until it’s time for school! 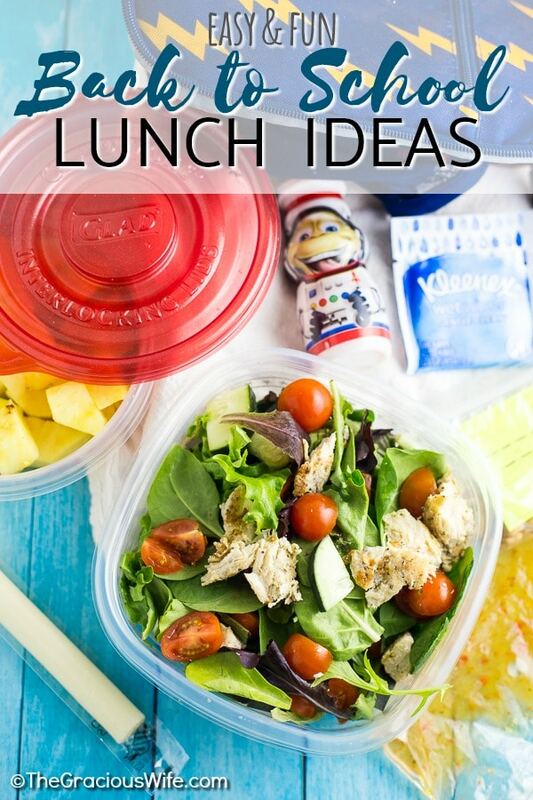 You can get all of your items for both of these lunch ideas at Target (check it out here)! 1. Add a silly joke to your child’s lunchbox. My kids love sharing the jokes with their friends! 2. Make a lunchtime survey, where your kiddos can tell you their favorite part of the day so far, how they’re feeling today, draw a funny picture to share with you later. 3. Write a code or a riddle and see if they can solve it. 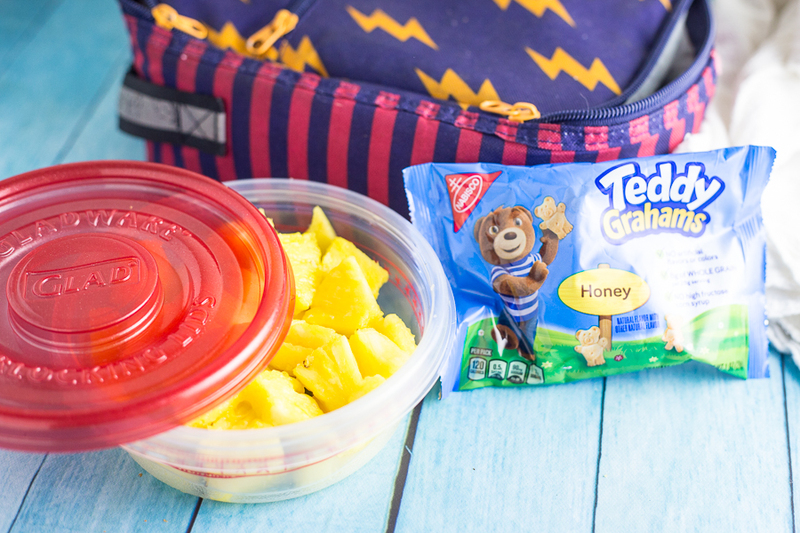 Head to Target to get everything you need for fun easy lunches all year long! What school lunch ideas do you have for this year? Share some more with me in the comments! I’m going to have to steal these for my own lunches! Way healthier than eating out or grabbing cafeteria food! Those are great ideas! Love the turkey wraps! I think I will add these into our lunches once school starts! Thank you! Love the station idea! Perfect way for everyone to get what they want for the day. Great lunch ideas too! 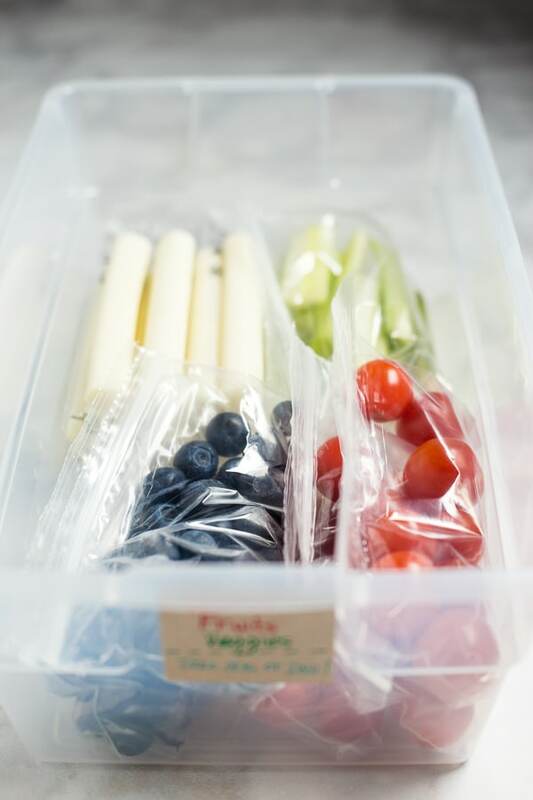 This looks like such an organized and healthy way to prepare lunches for the kids and have them help! I love the idea of a pantry station as well! Those are really great ideas. My niece and nephews love to have wraps. I wouldn’t have thought to put the dressing in the lid, great idea. This year 2/4 will be in school, so I was really trying to figure out lunch time. My problem is they are sooooo picky! I really like these ideas though, maybe I can get them to like it too!